In our latest episodes, we discovered that motherhood in games usually functions to a) scare us or b) serve as purely narrative filler that has no affect on our actions. With that in mind, I decided to try a potential exception to the rule: Shelter, a game from indie developer Might and Delight. While this game doesn’t give us the Ripley we were looking for–in no small part because the main character is, well, a badger–it is a welcome surprise in what is a dearth of representation. Unlike most games we researched, Shelter uses motherhood as both narrative hook and primary action. Like in most “dad” games–and unlike most games with moms–the protection of the child is your goal, and in Shelter, you have five cubs to look after. Unlike a lot of “dad’ games, this is a story without words; you are cast as an animal and you proceed as if by instinct. It certainly helps that navigating the world requires minimal mastery; your fingers will find the familiar “WASD” combination with ease, with the addition of “shift” to run. You begin in your den with four restless cubs, and one still, ghostly white one. Bringing it the one piece of food available in your den reinvigorates it. With no other directions, you move forward. The simple, wordless objectives combined with the game’s stellar score and sound design make it all too easy to fall into a rhythm of hunting and hiding. The twist is that when you fall out of that rhythm–when you loose a cub to a predator lurking in the dark–you keep going. You will hear the sharp musical crescendo and the cub’s cry signally its demise, but there’s nothing you can do. While protecting your children is wordlessly presented as the goal when you first revive your cub in the den, failing this basic set-up does not result in a game over, rather, you must trudge on as your mother badger. Without mouths to feed, you no longer need to hunt–something which, from a purely mechanical standpoint, feels like an easy cheat in progression from point A to B. However, the absence of your brood is felt. You are unburdened, but you are alone. The game, then, becomes less about motherhood–less about the bond between parent and child–and more about its absence. Shelter is short and contemplative, if not in the way I was expecting. There’s something to be said about our current fascination with parenthood–specifically fatherhood–as stakes for action. In a “dad” game like The Last of Us, we are tasked with killing X because it stands between us and our child, or going to Y because that’s where the child is. In these cases, losing the child is impossible, at most resulting in a game over. In Shelter, we kill X because it feeds our children; we go to Y because instinct tells us to do so. For most players of Shelter, I suspect that losing children is not only a possibility, but a reality. It’s a strange abstraction of the concept of parenthood that sacrifices the theatrics of most “dad” games–and, in many ways, our emotional connection to our child characters–and boils it down to its primal necessities: protection, survival, and the tangible, inevitable capacity for failure. Shelter is available on Steam, GOG. A sequel is expected for release this August. 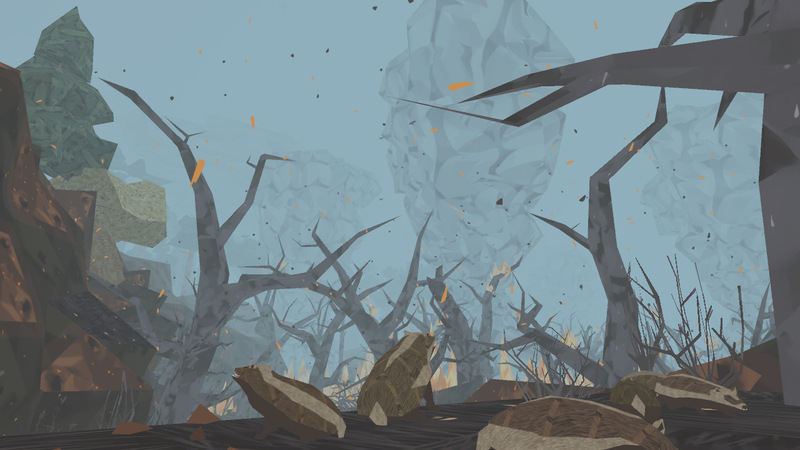 This entry was posted in Now Playing and tagged indie games, shelter. Bookmark the permalink. This sounds really interesting. Thank you for pointing this out. Great read! We are actually in the process of developing our own Indie Game.